I go to Varga Katalin Secondary Grammar School traditions are very important for everyone. One of these traditions is the Sports Day, where we can do sports and spend the time with our school mates outdoors. 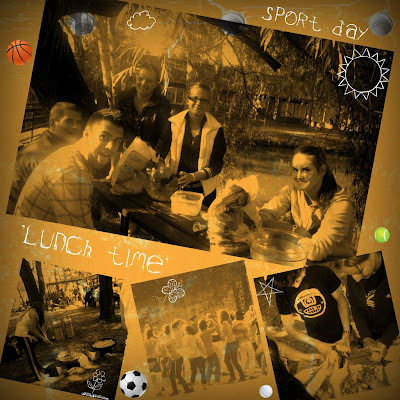 This year the Sports Day was held on 29th of September, in a picnic area called Millér. This park is a bit far from our school so we could go there by bicycle, or we could run or walk. Fortunately, the weather was the most suitable to do sports, so I enjoyed this day very much. When we arrived in the Park we started cooking because we had to cook a hot dish for lunch. Our P.E. teachers invited everybody for a Zumba dance lesson, where almost all the girl of the school were dancing and a few more teachers. There were different championships organised among the classes, for example football, volleyball, table tennis, basketball games and there was also a basketball penalty throw competition. I hate cooking so I rather played football. When we didn’t have matches, we weren’t bored because we could listen to music and talk with anybody from the school. Finally, one of my friends won the penalty throw game. Our class won the cooking competition as well. We made Gyros with Salads and French Fries. It was really delicious. I think it was a perfect day, because we could eat delicious meal and we were doing sports all day. So it was a good chance for us to be fit and healthy. As I have mentioned, I and some of my classmates were playing football all day. Fortunately, we have a lot of good football players in our class so we had a good team. We easily won in our group and we could also beat our opponent in the quarter-final. In the semi-final we had to play with 9.D and it was a big fight. We could get into the final, in which we played with the strongest team of 12.D, who are a year older than us. It was a very close and exciting match. At the last minute, fortunately, my team mate shot our winning goal and we became the champions of this year. Finally, here are some pictures of our last goal and some other events of the day.